An invasive nonnative species of grass that was threatening to push out native flora and fauna living in hundreds of acres of salt marsh in the bays surrounding San Francisco, California, has been knocked back using a one-two combination of ArcPad and ArcGIS Data Reviewer. Spartina alterniflora, a species of cordgrass native to the East Coast, was intentionally introduced in the 1970s in an attempt to restore marsh habit in the bay. This species of cordgrass is genetically similar to the native variety. When it bred with the native cordgrass, the hybrid produced spread much faster, thrived in a wider ecological range, and grew more densely than the native variety. 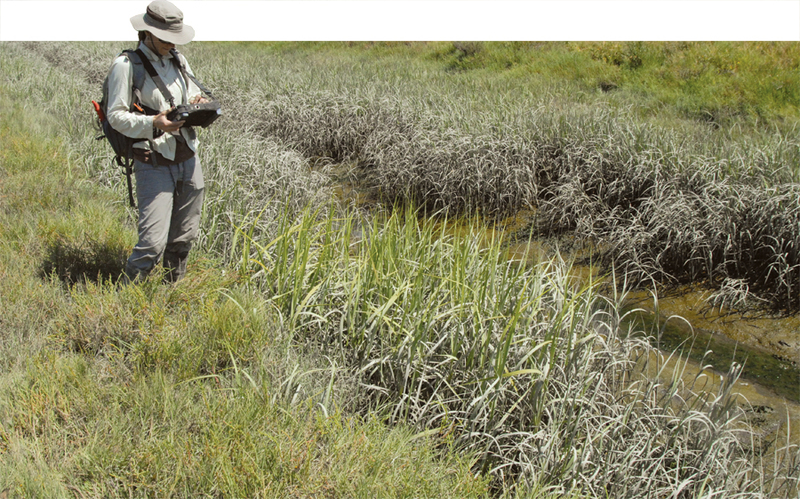 A field-worker for the San Francisco Estuary Invasive Spartina Project (ISP) using ArcPad to carefully document the position of a patch of an invasive grass species. Spartina alterniflora and its hybridized forms have blanketed shores along the south and central portions of San Francisco Bay and its estuaries. As it spreads, it edges out the slower-growing native variety as well as other indigenous plants, spoiling the habitat for dozens of native and endangered species. 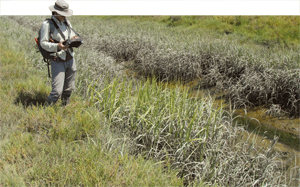 Conservationists working to eradicate the robust hybrid form of Spartina alterniflora, have used ArcGIS successfully for a decade to gradually gain ground against the invader. They recently added ArcGIS Data Reviewer, an extension to ArcGIS for Desktop and ArcGIS for Server, to their geospatial arsenal and believe it will play a key role in their continued success even as operating budgets shrink. The San Francisco Estuary Invasive Spartina Project (ISP) was launched in 2000 by the California State Coastal Conservancy in response to the threat posed not only to coastal ecosystems but also to surrounding flood control and mosquito abatement efforts. Before the "hybrid swarm," as it is called, could irreversibly tip the balance of the salt marsh ecosystems, ISP began its tracking and eradication program. Herbicide is selectively sprayed to eliminate hybrids. Initially, it could be sprayed using helicopters, airboats, and tanker trucks with long hoses. Increasingly, backpack sprayers are required to reach isolated or remote stands. The herbicide is only effective during the May to November growing season. In some locations, the endangered California clapper rail (recently renamed the Ridgeway Rail) has taken to the taller and denser invasive species for cover from predators, so eradication is restricted in these areas. Also, without DNA testing, which may take weeks or months, the immature hybrid is hard to distinguish from the native variety. From a peak coverage of more than 800 acres in 2005, the nonnative variety was reduced to 38.4 net acres by 2013. The entire operation, directed with GIS, is shifting its focus—and budget—to revegetation. However, the process of identifying and eliminating the remaining infestation remains central to the project. Accurate data provides the foundation for this work. "From a project management point of view, bad data quality could result in unnecessary expense treating misidentified Spartina; inaccurate reporting of progress toward eradication; or just scientifically questionable data, which would cause a deterioration of trust in and support for the project," said Peggy Olofson, the ISP project director. Field teams painstakingly gather that data, said Ingrid Hogle, GIS manager for ISP. The 15 staff members create 30,000 records per year or an average of 2,000 records per staff member. Field teams had to visually double-check each feature collected and indicate that they had checked it. Much of the quality assessment work on those records had to be postponed until after the busy field season. The long interval between recording and checking made it difficult to recall specific issues related to the data. Duplicate check-ins of data (still possible now but less likely because ArcPad Exchange Formt (AXF) checkouts are used in ArcPad). Using Data Reviewer, Hogle has automated many checks so they can be done closer to collection times. As a result, data checking is faster and teams still tasked with eradication can spend more time in the field. With ArcGIS Data Reviewer, Hogle said the time needed to quality-check data should be reduced by 75 percent. With Data Reviewer, she can set up and validate rules specific to individual datasets. For the varied tasks the ISP faces, that level of configuration is important. For example, Hogle can identify and delete duplicate features as soon as the staff member handling check-ins alerts her. Handling that step quickly can prevent edits from being made to each duplicate entry that would require time to identify and reconcile. ISP field staff use ArcPad to collect data and sync it to the ISP geodatabase. For each DNA sample, a point feature class is collected. In addition, staff are required to log a second feature near the patch where the sample was found. If entered correctly, each point would have just one patch associated with it. Data Reviewer will flag all entries with more than one patch. It will also tell Hogle if the patch data collected in the field is not where it should be, which could also be a sign of bad data. Without such a check, incorrect DNA data can enter the database and lead to treatment of desirable plants and missed treatment of the invasive plants. Moreover, it can also lead to misidentification in future years based on the incorrect data and could lead to inaccurate categorization of the hybrid's site-specific characteristics. "We have had to throw out data when a field biologist makes a mistake in labeling by using the same sample code for two different samples, for example. And in the past, I spent many hours trying to unravel such mysteries," Hogle said. The combined features of ArcPad and Data Reviewer have resolved that scenario, she explained. Data Reviewer has also helped Hogle administer the process for fixing data errors. After she runs Data Reviewer, it generates a sorted list of errors that she can prioritize. She can delegate simple issues to non-GIS staff freeing her and her GIS team to tackle any critical issues first. "There are only so many hours in a day to fix data issues before tomorrow's fieldwork," Hogle said. "I'm a really big fan of Data Reviewer." A longtime Esri user, Hogle discovered Data Reviewer in her search for technology that would help ISP apply as much of its resources in the field as it could. She now hopes to integrate even more of the ArcGIS platform into her work. For more information, contact Ingrid Hogle, Invasive Spartina Project at 510-536-4782, ext. 205 or Jay Cary, Data Reviewer manager, Esri Professional Services solutions team at 909-793-2853, ext. 4859.